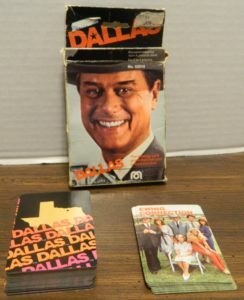 Sort the cards between the Dallas cards and the Ewing Connections cards. The dealer is chosen by whoever draws the highest valued asset or cash card. Both sets of cards are shuffled separately. Each player is dealt seven Dallas cards and one Ewing Connection card. The top two cards from the Dallas deck are turned face up to form the trading row. Trade in one of your Ewing Connection cards for a new card. The card that is discarded is placed at the bottom of the Ewing Connection deck. A player can discard a cash card to draw another Ewing Connection card. The player will then draw two cards from the Dallas deck. If a player has three of the same type of asset in their hand, they can choose to play the cards out in front of them to form an investment. If a player plays a Ewing Connection card to an investment (the same type of the investment), the player can play additional cards of the same type or cash cards to an investment. This player has created a securities investment. 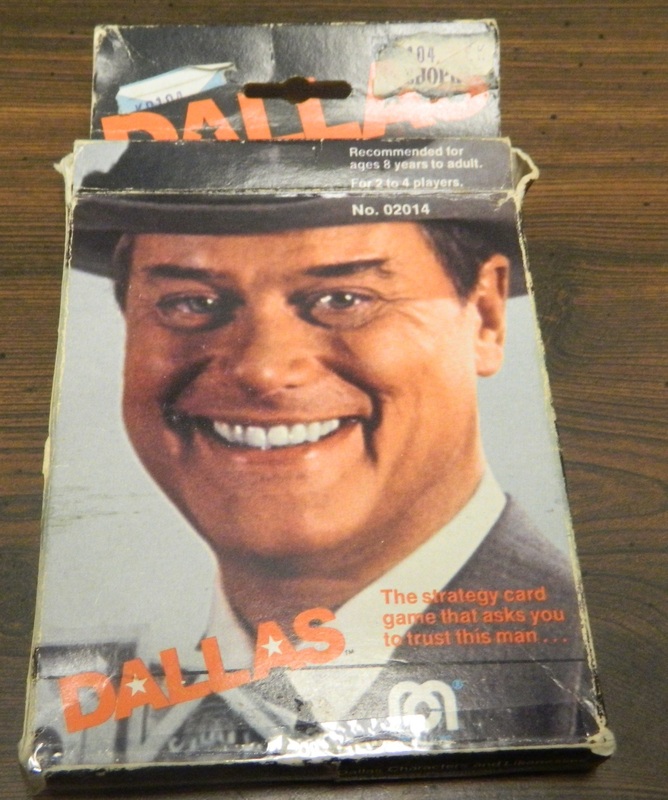 They have played three securities cards as well as a Ewing Connection card of the same type. In future turns they have added a cash card and another securities card which has increased the total value to $2,800,000. On a player’s turn they can also buy or trade for asset cards from the trading row. A player can use a cash card to purchase asset cards from the trading row. When purchasing cards a player must take a card(s) that exactly match the value of the cash card that was used. The cash card that was paid is discarded and the cards that were bought are added to a player’s hand. The player can also choose to trade one asset card for another asset card from the trading row of the same value. The one restriction is that the card acquired must be a card that you immediately play to the table. This player has a couple of options to acquire cards from the trading row. The player can trade the $800,000 oil card for the $800,000 securities card. They could also trade the $1,000,000 land card for the $1,000,000 real estate card. The player could also use their $1,000,000 cash card to either buy the real estate card or the securities card and the $200,000 card. This being the Dallas card game, players are able to steal investments from the other players. A player’s investment is not protected unless a JR card is played on it. Any unprotected investment can be stolen by the other players. An unprotected investment can be stolen if a player plays the associated Ewing Connection card or a JR card on it. The player who stole the investment can now add additional cards to the investment or could combine it with an investment they already control of the same type. A player has played a JR card against this investment which allows them to steal the entire investment. 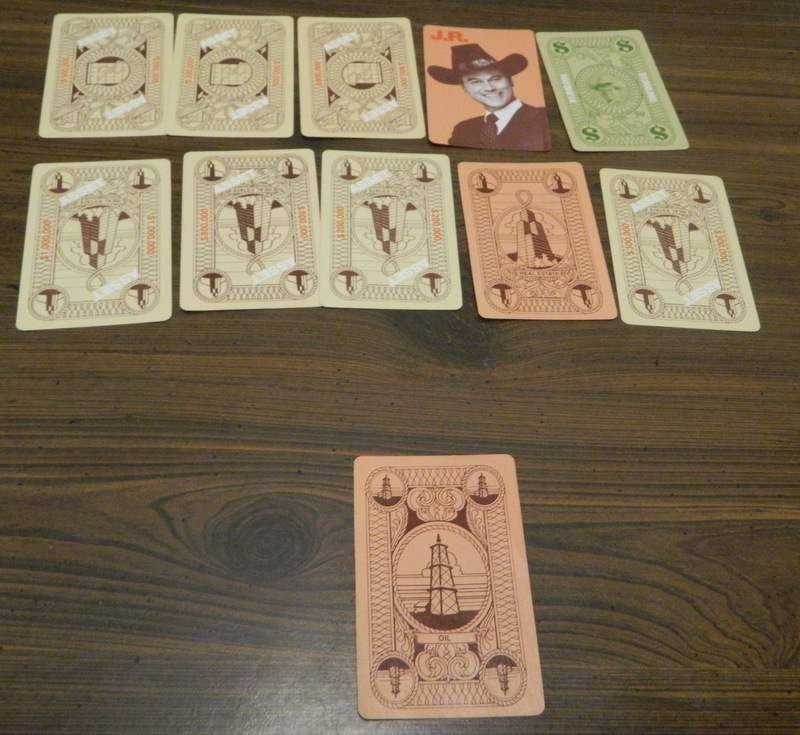 At the end of the player’s turn they must add one of their Dallas cards to the trading row. A round ends when one player has no cards left in their hand. Each player then calculates the value of their investments for the round. Players earn points equal to the value of all cards played out in front of them in investments. Players also score $1,000,000 for every Ewing Connection card that is part of one of their investments. Players lose $1,000,000 for every Ewing Connection card left in their hand at the end of the round. If no one has reached $20,000,000 between all of the rounds played, a new round is played. The round has ended and this player has two investments. The top securities investment is worth $2,600,000. The real estate investment is worth $2,300,000. The player also earns an additional $2,000,000 for the two Ewing Connection cards they were able to play to their investments. The player had one Ewing Connection card left in their hand at the end of the game though which will lose them $1,000,000. In total the player would score $5,900,000 for this hand. The first player to earn 20 million dollars in assets and cash wins the game. When a board game company is looking for a quick cash in, one of the easiest things to do is to find a license for a movie or television series to base a board game on. Until recently most games based on licenses were simple roll/spin and move games with the appropriate theme pasted on in order to appeal to fans of that particular franchise. I have never watched the Dallas TV show and the only thing I know about the show is the “Who Shot JR?” storyline. With little knowledge of the show I really didn’t know what to think about the game. I give the game creators some credit for putting some effort into the game. The creators could have easily just made a roll and move game and slapped on the Dallas license. Instead the creators tried to create a card game that simulated the television show. The game is a pretty simple set collection game with a couple additional mechanics using the Ewing cards to create investments/sets and having a market where players could buy/trade cards. As a whole the game is very easy to play. It should only take minutes to learn. The length of a hand can vary quite a bit with one hand lasting just minutes while another can last 10-15 minutes. As a whole the game doesn’t have a lot of strategy since it mostly just involves creating sets. You do have some decisions to make though which gives it a little more strategy than some set collection games. If you really liked the Dallas television show and are looking for a simple fast card game, you could have some fun with the game. If I would stop the review right here you would think that the Dallas Card Game is not that bad. While I give the creators credit for putting some effort into the game and there are some interesting ideas, the game simply feels broken. The game feels broken because the game relies almost entirely on luck, and some elements of the game are never really flushed out. The biggest problem is the reliance on luck. Your decisions have an impact on the game but luck will be the deciding factor most of the time. Whoever draws the right cards at the right time is going to win the game. The luck factor is most prevalent when it comes to the JR cards. The JR cards are rigged and will decide who wins a particular hand. The JR cards are rigged because they allow you to steal someone’s investment and the JR card prevents anyone else from stealing it for the rest of the game. A player could spend an entire hand creating a valuable investment and you could steal it just because you were lucky enough to draw a JR card. Once you have an investment with a JR card on it you might as well try to throw as many cards as possible on the investment since there is not way it can be stolen. This actually makes me believe that it is best to not play any cards until you have a set that you can protect with a JR card, all of the JR cards have already been played, or you can play all of your cards which will end the round. You don’t have to immediately play a set so you might as well keep it in your hand for as long as possible so other players can’t steal it from you. Playing the cards out in front of you ahead of time doesn’t really benefit you unless a player is close to playing all of the cards from their hand. At this point you will have to play the cards to try and get points and prevent getting negative points for the round. This reliance on luck could give a player next to no chance to even do anything on their turn. In one hand my group played, one of the players got only one turn before the hand ended. Since this player could not play any of their cards on their turn, this player was unable to do anything in the entire hand. On top of the reliance on luck, the game could have explained some of the rules a little better when it comes to the end of a hand. The rules say a round doesn’t end until one player gets rid of all of their cards. The problem with this though is that there will be a problem when you run out of cards in the draw pile. We decided to reshuffle the discard pile. This doesn’t really help since all of the cards in the discard pile are money cards so they just flooded the trade market. The round didn’t end until one player was lucky to draw the right Ewing card that they could play. This took quite a few rounds as each player could just discard a card at the end of their turn. The creators of the Dallas Card Game deserve some credit for trying to make a card game based off of the television show when most people would have just made a roll/spin and move game. 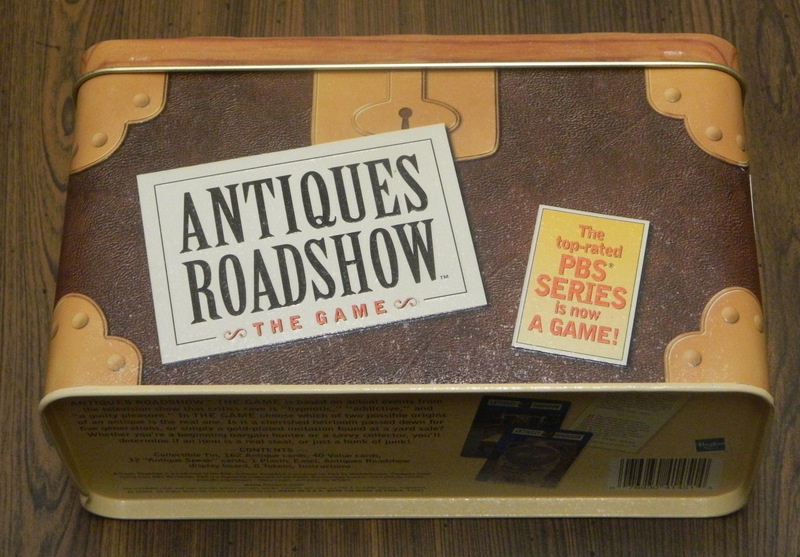 The game is easy to learn and play and may appeal to fans of the television show. Unfortunately the game is broken due to the high reliance on luck. The luckiest player will win every hand since the JR cards are way too powerful. I have a hard time recommending the Dallas Card Game. The game had some potential but it doesn’t live up to it. If you hate high reliance on luck or simplistic games in general you will not like the Dallas Card Game. The only people I can possibly recommend the game to are people who loved the television show and don’t mind simple games that rely heavily on luck. Even in this case I would recommend only picking up the game if you can find it really cheap. If you would like to purchase the Dallas Card Game, you can purchase it here . The creators tried to put some effort into the game. Is an easy and straightforward game. The game relies way too much on luck.